All the deliciousness of apple dumplings but without all the work! 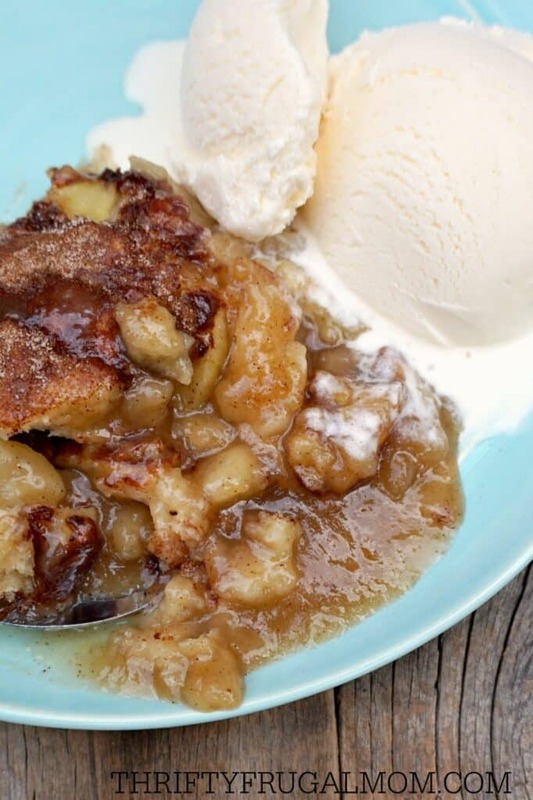 You’ll love these Easy Apple Dumplings! As a child, I loved watching my mom make old fashioned apple dumplings. Seeing her skilled hands mix up the dough from scratch, cut it into squares and then carefully wrap each square around a big, cored apple, filled with sugary goodness, totally fascinated me. I can still see her bending over the open oven using her baster to spread the syrup over the dumplings as they baked. We all loved when she took the time to make her apple dumplings, but it didn’t happen often because of how time consuming they were to make. Several years ago an older friend of mine, who is known for her good cooking, told me that she had made a dessert that tasted like old fashioned apple dumplings, but was much easier. I was all ears and of course, had to get the recipe and try it myself! 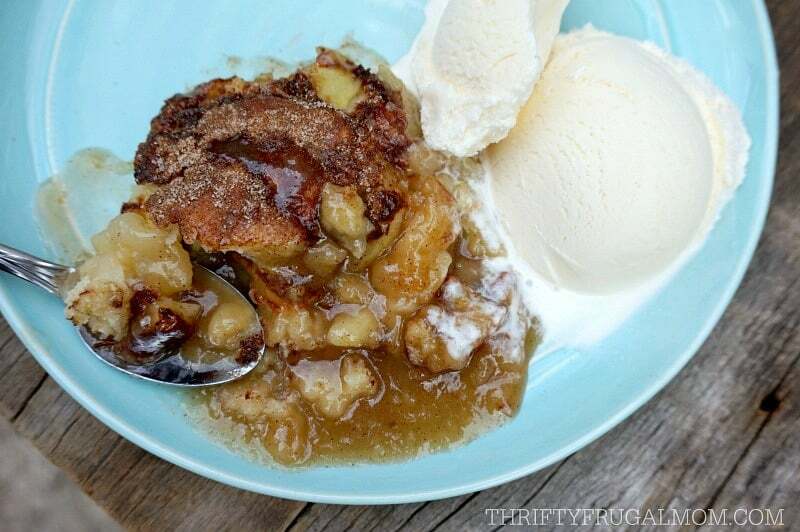 And goodness, these Easy Apple Dumplings are just perfectly delicious! I mean, how could they not be with all that gooey, caramel like syrup?! 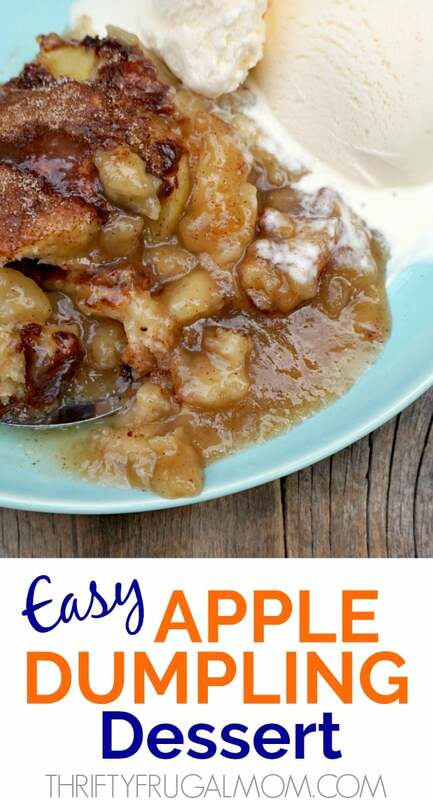 We love eating this easy apple dessert piping hot with lots of vanilla ice cream. But some people prefer pouring milk over it instead. Either way, I think you’ll find that it’s quite delicious! All the deliciousness of apple dumplings but without all the work! 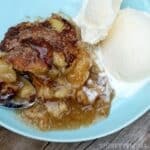 You'll love these Easy Apple Dumplings! Add vanilla and butter. Stir until butter is melted. Pour into a greased 9×13 baking dish. Meanwhile, make dumpling mixture by mixing together first 5 ingredients until crumbly. (A pastry blender makes this really easy!) 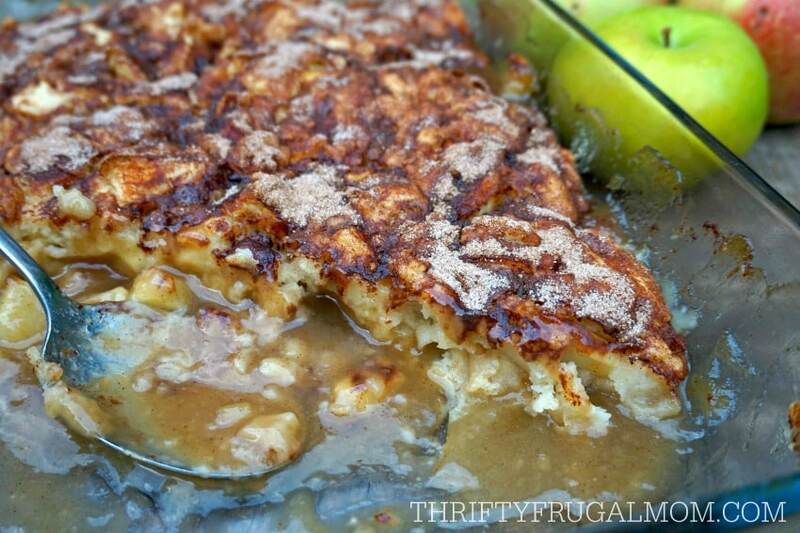 You'll want to use a really large bowl for this since you'll be adding the apples too. Something 10 cups or so works well...even a kettle! 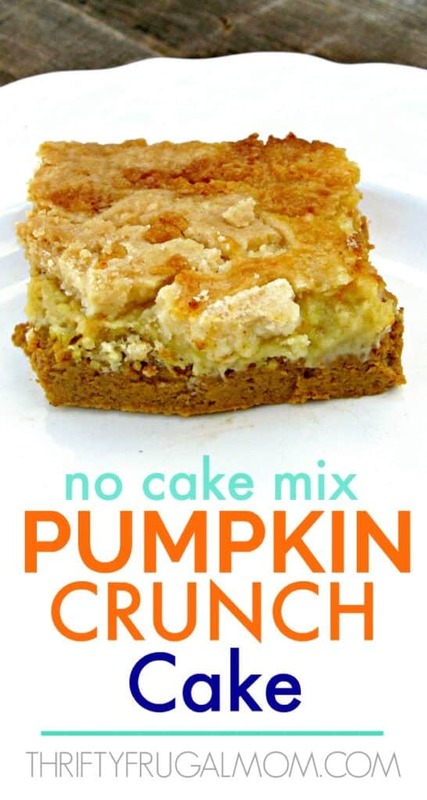 Combine milk and vanilla and stir into the mixture just until moistened. Drop by spoonfuls over sauce in dish. Combine sugar and cinnamon and sprinkle over the top of dessert. Serve warm with ice cream or milk. Thank you for the easy print out feature! i wasnt so sure about this recipe but decided to try it since i love apple desserts. both my husband and i relly loved it. i loved the fact that it wasnt overly sweet but that it was sweetened by the apples. thanks for sharing the recipe! i will make this again! Sarah, thanks so much for taking the time to let me know that you all enjoyed my recipe. That always makes my day! :) So glad you all loved it and I especially liked that you appreciated that it wasn't overly sweet since that was one of the things I was really trying to go for in this dessert. This looks so good. What kind of apples are used? So glad that you enjoyed it, Ligi! My friends enjoyed this recipe so much that it was completely gone within minutes. Thanks for such a delicious dessert! It was very good, but mine did not turn out juicy like your's. It was kind of dry.... But we ate it anyway with whip cream. What could I have done wrong. Jean, I'm so sorry about that! It's always frustrating when a recipe doesn't turn out as it should. I really am not sure what to tell you, because I have made this recipe countless times without it every being anything but like the picture showed. You did for sure add the right amount of liquid- both the water and the milk? The only other thing I can think of is that maybe your oven bakes a little hot and so you over baked it? Or didn't it seem over baked? I wish I knew what to tell you. I'm glad that it was still edible, but I really wish you could have enjoyed it as it was meant to be. Jean, I keep thinking about your comment and thought of two more things. My sister-in-law actually made this last night for a dinner we shared together and we ended up eating it when it was not hot out of the oven. It was still warm, but not piping hot like it usually is when we eat it. And there was not nearly as much syrup as what I remember there usually being, even though it was still delicious. That made me realize that if it sets for a bit, I think it tends to soak up some of the liquid, which may have been what happened to you. Also, I remembered since I first replied, that I think I may have adjusted the amount of apples along the way too. In my original post, I think I only used about 3 1/2 to 4 cups of apples. But later on I started adding more because we prefer lots of fruit in our desserts. The thing is, it also probably cut down on the amount of syrup per serving too. So if you'd prefer it to be more moist, you could try cutting back on the amount of apples, or increasing the amount of syrup. Hope that helps! Yum! This looks amazing! I can't wait to try it!